I have nothing new at the moment. I briefly sketched today but a wasp drove me away. 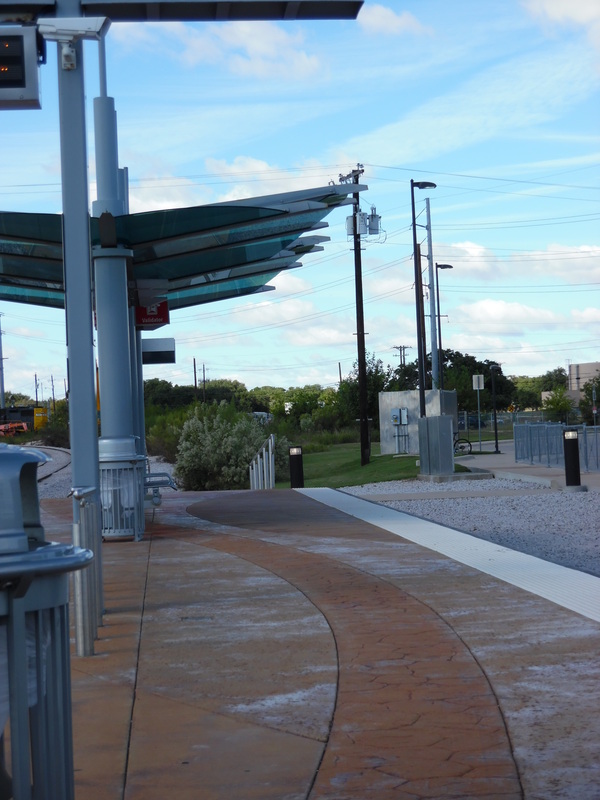 It was meant to be the beginning of new project based on the Cap Metro Rail line that goes though Austin and some parts of Cedar Park, that started in 2010. It is only one line but it goes through some pretty diverse neighbourhoods. This is the view I chose as it was in the shade and there was a seat. Even with the temperature in the 70’s it would have been easy to get sun burnt and as you can see, there was not a lot of shade to be had. It is also not the most inspiring view to draw, so when the wasp arrive and didn’t want to leave, it gave me an adequate excuse to depart with a half arsed drawing. So I am not sure I will pursue this particular project. I know I want to move away from the landscape drawings I have been doing and I love buildings as I am at heart a big city person. However, Pflugerville is not the most interesting town to live it. Apart from the old town which is typical Americana of the early 20th century, it does not have much character being mostly new build homes in the US standard. In the last count, the city has nearly 48,000 residents and it has grown 93.40% since 2000, the year we moved here in fact. That makes it larger than Kilmarnock which I thought was a fairly large city in Scotland but Pflugerville has none of the character or history that Kilmarnock has. So the idea of the commuter rail came to me as a way of moving into a more urban setting. It has a strong emotional link as my childhood and early adulthood was spent travelling the tube or buses in London. I still might go with the idea but I think I need to explore the line more before I commit myself. Austin itself is very interesting but unfortunately it is quickly disappearing into a maze of new high rises as the city grows. Without the older buildings it will soon be just another big US city which is a shame. I also have the dilemma of where I am going with all this work and I think is reflected in the chaos which is currently my studio. Quite frankly its a mess and it has been for several months. For the last 6-4 weeks I have largely avoided it which is easy as it is upstairs. I think I am closer to resolving that issue and it is probably going to involve moving back to mixed media projects as I am naturally drawn to that type of work. Anyway that’s the update for now and hopefully normal service will resume soon.